I keep getting emails from YouTube telling me about random strangers supposedly sharing videos with me. I do not know these people and they are unlikely sharing videos with me. It seems more like YouTube is either sending me links to related videos or doing some sort of auto-send-to-all-commenters nonsense. They are definitely coming from “mr.google” :-P as you can see from the header of the latest message (listing 1). How can I get YouTube to knock it off (short of deleting my Google account altogether)? Listing 1: Header of recent shared-video message showing Google/YouTube as the source. If you're using Gmail, you can create a filter so these messages don't hit your inbox. If you don't want any emails from YouTube, you can search for it and then click Create filter. You can add additional criteria on the next page, confirming the results before creating the filter. Make sure you are logged into your google account and go to youtube.com. 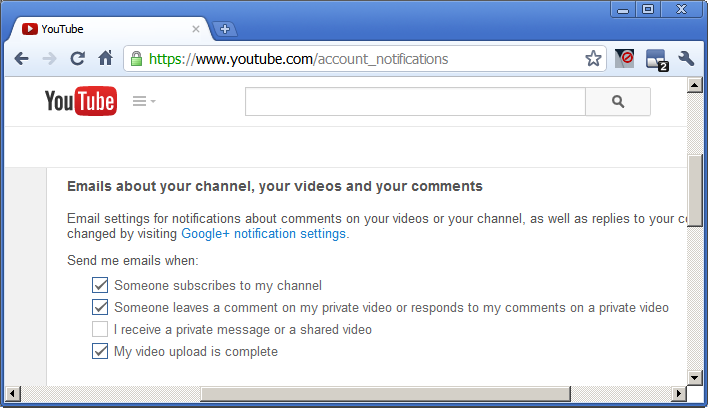 Next to the "Upload" button on the top dashboard, click on the dropdown settings gear and select "Youtube settings". In the side menu under "Account Settings" select the "Privacy" option. Under "Search and Contacts", Allow only my contacts to send me messages and share videos is unchecked by default, meaning anyone can share video with you. Check it, and your problems should go away. and checked Delete to trash as an action. So normal mail from YouTube will pass and the spam will go to trash. Not the answer you're looking for? Browse other questions tagged youtube notifications spam-prevention or ask your own question. How to blacklist spam emails with forged addresses? Can you get URL for YouTube video from Google Drive?